This should keep us busy for a while. First thing that jumped out at me was the decrease in normal cost of benefits for New Jersey, especially between 2010 and 2016..
lol ……………that is when compared to other (also excessively compensated PUBLIC Sector workers). The comparison should be to those who PAY that compensation …… mostly PRIVATE Sector Taxpayers. 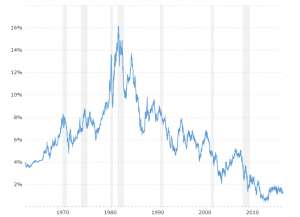 Couldn’t find the 20 year T-bill rates that Biggs used in his 2014 paper, or the discount rates NIPA used to compare normal costs, but this graph is the 30 year treasury rate, which is indicative of the trend. If we assume they were appropriately compensated, the lower interest rates between 1998 and 2017 are the reason for the rapid increase in “normal costs”. If they were appropriately compensated in 1998, at approximately 5 percent, what were they (we) compensated in the period from 1970 to 2000? And what will they be when/if rates increase? Table 3 says private sector wages rose much faster (15%) than public wages (8%). Looking at several samples in table 4, (Alabama is a good example), public wages grew much faster than private. I believe Biggs said all these numbers were adjusted for inflation. Example, California state miscellaneous workers pre-2000 formula was 2%@60. From 2000 to 2012, the formula was 2%@55. From 2012 to present, the formula is 2%@62. So why does Biggs say total compensation of public workers has increased relative to the private sector? I don’t see it in my pocket. Two words… “discount rates”, as per NIPA, 6 percent in 2000; 4 percent in 2017. “…it appears that the 1998 to 2017 NIPA series began with a 6 percent nominal discount, gradually declining over time to a current rate of 4 percent. Lower interest rates increase the cost and value of pension liabilities, in real terms as well as expressed through actuarial valuations. It is more costly to promise a guaranteed benefit in future years if the interest rates on safe investments have fallen. Likewise, such a guaranteed benefit is more valuable to participants in a low interest rate environment. And there you have it. Do I understand this correctly, John? I haven’t gone through detail on Biggs’ numbers since I have a prejudice against using government figures – especially when they come to pension funding – and drawing conclusions. I was most interested in the change in wages, I have heard “opinions” that public wages are increasing faster that private. This is something Biggs should be good at researching. Too bad the two tables don’t seen to agree. And Biggs statement that pension “formulas” increased in the early 2000s, then retrenched after 2009 seems to agree with Munnells study and my own observations that pensions have not increased as a percent of salary. But the big kicker, according to Biggs, is the NIPA difference in discount rates, from 6 percent to 4 percent. Don’t think of it as a 2 percent decrease. It is a 33 percent decrease. Disgusting yes. Coward? It is not cowardly to take a deal like that. Disgusting that the council(in cohoots with them I’m sure) did that. Doesn’t mean he is cowardly. Just means he doesn’t deserve what he is getting. Not by a long shot. If we assume as 2% annual Cola increases, the up-front cost to purchase that stream of payments or it’s present value (PV) is $5.734 Million. If we assume as 3% annual Cola increases, the up-front cost to purchase that stream of payments or it’s present value (PV) is $6.671 Million. Do you think the City’s Taxpayers would allow this if they REALLY had a choice ? The $ amount payable at the beginning of each MONTH was closely approximated by using $ ANNUAL total payable at each midyear. Forgot to mention …………. the above PV’s were calculated by discounting the mid-year-assumed annual COLA-increased payments at 4% interest. You should have included the first sentence of the next paragraph. “… but this does not change the value of benefits that must be paid in the future. These methodological issue are discussed in greater detail below. This article does not intend to resolve all these questions. ” But they may be correct, NJ’s unfunded liability may never be funded or paid out, so it should not count as compensation paid. The are many articles about the lack of real wage growth (I think they are using nominal growth). I also have to wonder if comparing the average salaries of the top tier in the private sector with state workers makes sense, I suspect variance or standard deviation is way way larger in the private sector. I also wonder how at the bottom of the private sector how welfare, medicaid ect. is taken care of. Would be interesting to see the feedback. The tables don’t seem to verify that, unless I am reading them wrong. Pension “generosity” seems to be stable or declining, either as percent of wages, or in dollar amounts, adjusted for inflation. Pension “generosity” is not the reason for spiralling costs in the last decade. The elephant in the room is decreasing interest rates. The obvious solution is to switch to defined contributions for all public employees prospectively. Then start handing out some big wage increases. If all pensions now “cost” more or are more “valuable” to the recipient, due to lower corporate bond yields, or Treasury yields, what, if anything, does that say about the cost of Social Security? Table 3, Private Sector 1998-2017: How can wages have increased 15%, benefits 39% and total compensation 38%? What kind of wage/benefit ratio would you have to have to come up with that skewed total? Does look odd relative to the 3 Public Sector categories.